POLANSKI (AUS) (Bay 2010-Stud 2014). 4 wins-1 at 2-from 1450m to 2500m, A$1,173,565, Victoria Derby, Gr.1, MRC Norman Robinson S., Gr.3, VRC UCI S., L. Out of a three-quarter-sister to SW Ballroom Babe (WRC Captain Cook S., Gr.1). Related to SW Just Dancing, SW Tahni Girl, SW Hidden Dragon, SW Maschino, etc. Sire of Here's Alwyn, Lesedi, The Sparkle Legend, Zimowy, etc. His oldest progeny are 3YOs. Street Allure (f. by Street Boss). 3 wins at 1100m, 1200m, A$180,730, MVRC Eurozone H., MRC MiStable H., 2d VRC Birdcage H., 3d MRC Mannerism S., Gr.3. Barachino (g. by Pentire). 2 wins at 2250m, 2400m in 2017-18 in Aust. Katazyna (f. by Shocking). Winner at 1700m in Aust. Pentian (g. by Pentire). Placed at 3 in 2017-18 in Aust. Regimental Dance. 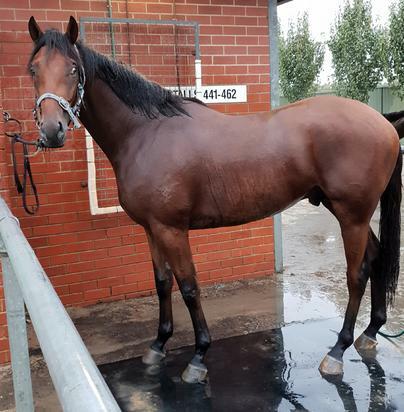 3 wins at 1200m, 1450m, 3d MRC (Mornington) Iasbet.com H.
Diggers Fortune. 2 wins at 1300m, 1600m in Aust. Valfreyja. Winner at 1400m in Aust. Diggers Reward. Winner at 1600m in Aust. Hussallet. Winner at 1600m in Aust. Halliday Road. 3 wins to 1000m, A$103,330, to 2017-18 in Aust. Temple Place (Sadler's Wells). 7 wins-1 at 2-from 8¼f to 17f, Haydock Bank of Scotland Corporate H., Chester Breitling Watches & Waltons H., 3d Ascot Autumn S., Gr.3, Chester Vase, Gr.3, Newmarket Feilden S., L, Newcastle TSG Seaton Delaval Trophy. Ballet Score. Winner. See above. Sempre in Oro. 7 wins-2 at 2-from 1200m to 2000m in Russia, Russian 2000 Guineas, 3d Krasnodar Milers Cup. Farolero (Eskendereya). 4 wins-1 at 2-from 1100m to 1800m in Panama, 2d Panama Clasico Arquimedes Fernandez D, Arquimedes Jr, L, 3d Panama Clasico APPUCAPA, L, 4th Panama Clasico Dia Internacional del Trabajador, L, Clasico Union de Preparadores, L.
WINGED VICTORY (Nijinsky). 5 wins from 8½f to 1½m, Gulfstream Park Fort Lauderdale H., Gr.3, Haydock July Trophy, L, Gulfstream Park Allowance-twice, 2d Royal Ascot King Edward VII S., Gr.2, 3d Churchill Downs Turf Classic S., Gr.1. Sire. SERVICE STRIPE (Deputy Minister). 10 wins-1 at 2-to 7f, Detroit Pontiac H., L, Remington Park Best of the West H., 2d Detroit Beau Genius H., L, 3d Thistledown Isi Newborn Memorial H., L. Sire. PUZZLED LOOK (Gulch). 7 wins. See above. WHERE'S THE RING (Seeking the Gold). 6 wins-1 at 2-to 6½f, Remington Park Chuck Taliaferro Memorial S., L, Keeneland Allowance, 2d Oaklawn Park Count Fleet Sprint H., Gr.3. Sire. WEDLOCK (Maria's Mon). 5 wins-2 at 2-from 6f to 9f, Delaware Park Vincent A Moscarelli Memorial S., L, 2d Delaware Park Kelso S., L.
EVER AFTER (Kris S). 5 wins-1 at 2-at 1m, US$240,678, Churchill Downs Edgewood S., L, 2d Keeneland Appalachian S., L. Producer. EXTROVERT (Wild Again). 13 wins from 5½f to 1¾m, Prairie Meadows I-80 H., L.
BROKEN VOW (Unbridled). 9 wins from 7f to 9f, US$725,296, Monmouth Philip H Iselin H., Gr.2, Keeneland Ben Ali S., Gr.3, Delaware Park RRM Carpenter Jr Memorial S., L, Pimlico Sir Barton S., L, 2d Meadowlands Cup, Gr.2, Keeneland Fayette S., Gr.3, 3d Gulfstream Park H., Gr.1, Suffolk Downs Massachusetts H., Gr.2. Sire. THRESHOLD (Homebuilder). 20 wins-3 at 2-from 5f to 8½f, US$286,339, Detroit Renaissance S., L, Southfield S., L.
ALWAYS IN MY HEART (Hennessy). 6 wins from 7½f to 8½f, Sam Houston Park Sam Houston Distaff S., L, 3d Keeneland Valley View S., Gr.3. Producer. I THEE WED (Affirmed). 8 wins from 5½f to 8¼f, US$496,199, Woodbine Nearctic H., Gr.2, Allowance-3 times, 3d Woodbine Bold Venture H., L, 4th Woodbine Vigil H., Gr.3. FOREVER TOGETHER (Belong to Me). Champion Turf Female in USA in 2008. 9 wins-1 at 2-from 6f to 1¼m, US$2,957,639, Saratoga Diana S., Gr.1-twice, Keeneland First Lady S., Gr.1, Breeders' Cup Filly & Mare Turf S., Gr.1, Keeneland Jenny Wiley S., Gr.2, Gulfstream Park Forward Gal S., Gr.2, 2d Belmont Just a Game S., Gr.1, Hollywood Park Gamely S., Gr.1, Woodbine Canadian S., Gr.2, 3d Saratoga Diana S., Gr.1, Belmont Just a Game S., Gr.1, Keeneland First Lady S., Gr.1, Breeders' Cup Filly & Mare Turf S., Gr.1. Producer.